​The Watervliet Public Library was founded in May 1953 under the auspices of the Watervliet Civic Chest, Inc. From the beginning the library has had tremendous support from the community. The original Library holdings consisted solely of donations from the public and the original work force consisted solely of volunteers. Financial support came primarily from the Chest, although important donations also came from the Watervliet Rotary Club, the Watervliet Lodge of Elks, and the Knights of Columbus. The library's first librarian was a volunteer. Sybell Maclay was also the librarian at the Watervliet High School. She began cataloging book donations in September 1952. Her services were invaluable, as the library had no funds to compensate a professional librarian. Esther Madsen carried on as volunteer librarian until 1967. Since 1967, the Board of Trustees has engaged the services of various professional librarians. The library's current director is Kelly Vadney. The library employs four staff members in addition to the director and has a dedicated group of volunteers. In 1965, toward the end of Mrs. Madsen’s tenure, the library received a provisional charter from the New York State Board of Regents, thus officially becoming the Watervliet Public Library. The permanent charter and Certificate of Registration were granted nine years later, in 1974. In February 1980, the library moved into its present location in the Senior Citizen Complex. At this time, the library also became a member of the Upper Hudson Library System (UHLS). UHLS is a federation of public libraries in Albany and Rensselaer Counties. Through UHLS, the Library lends and borrows books through inter-library loan and participates in the Upper Hudson Library Access Network or UHLAN. UHLAN is an on-line catalog that provides information on holdings in UHLS libraries. Watervliet has been fully active in UHLAN since August 1997. In 2015, the library underwent a massive renovation. The total cost for this 1,365 square foot expansion project was $660,000. Over $296,000 in construction grant funding was received from the NYS Education Department through the New York State Library to fund the project. The remainder of the funding came from private donors. The expansion was undertaken with three goals in mind: expansion and improvement of existing library space to better serve the community, expansion of the programming offered to patrons, and creating more flexibility within the library to meet the scholastic and programming needs of the community. The addition is the home to the new Mary P. O’Brien Quiet Reading Room and the Bill and Judy Fahr Children’s Area. The existing space was completely renovated, incorporating new technologies and allow the library to better serve the community. Construction was completed in early February 2016. In 2017, the Library Board of Trustees secured $150,000 in annual funding through a tax levy. Community members signed petitions and voted for this measure, which guarantees the annual funding. 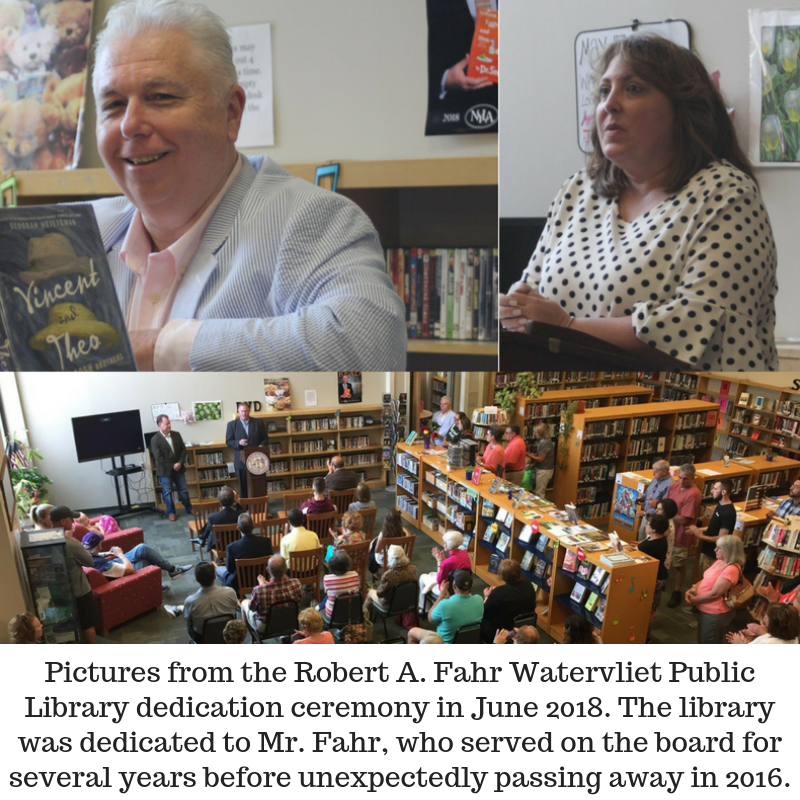 In 2018, the library was dedicated to Robert A. Fahr. Bob Fahr served as the board's treasurer for several years until he passed away unexpectedly. 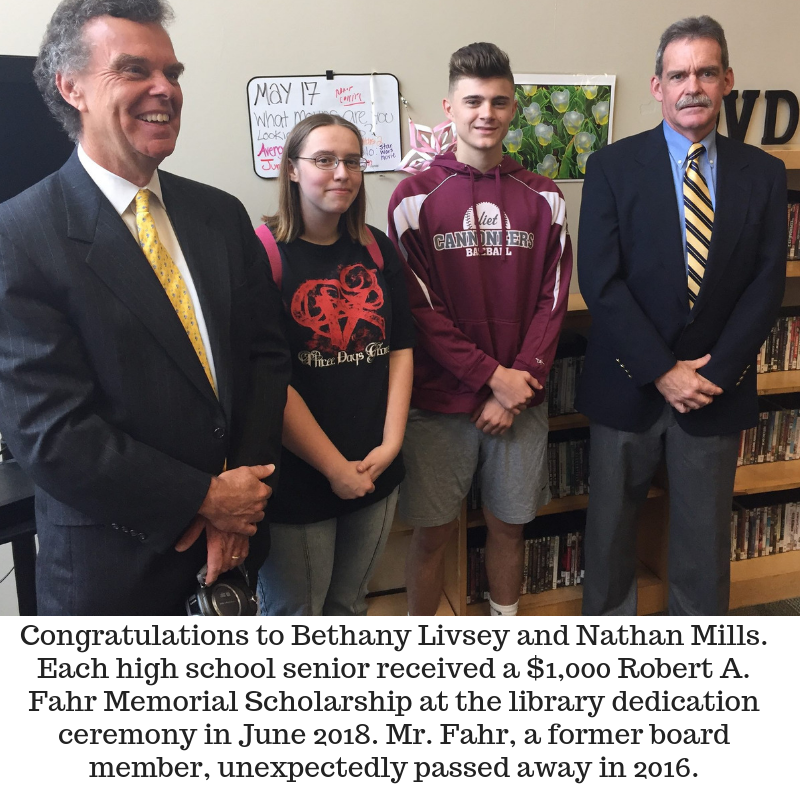 The library Board of Trustees and the Fahr family worked together to create a memorial scholarship in his memory as well. 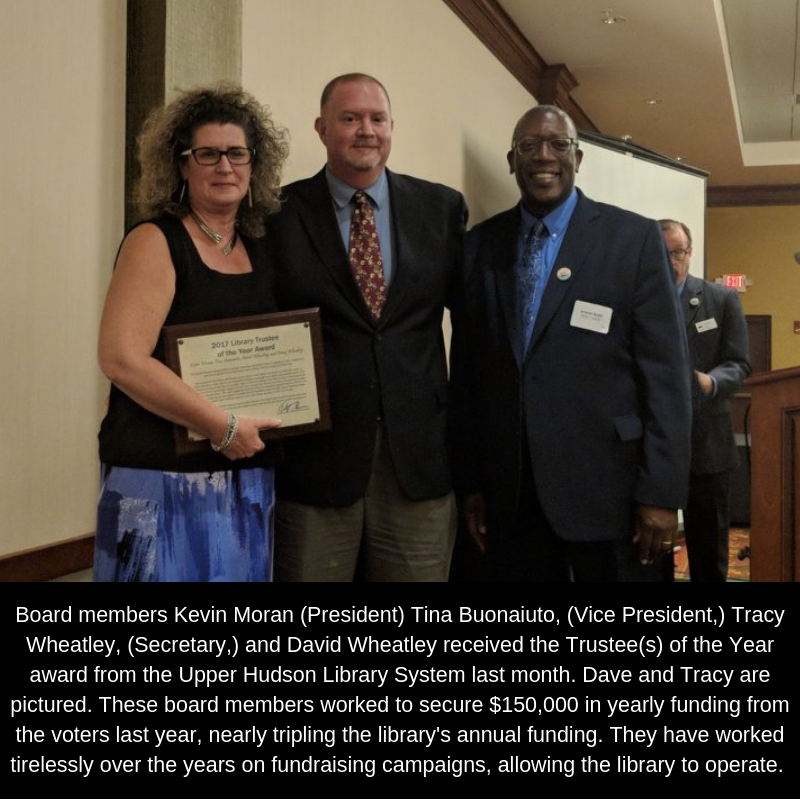 ​Also in 2018, Robert A. Fahr Watervliet Public Library board members Kevin Moran, Tina Buonaiuto, Tracy Wheatley and Dave Wheatley were recognized as trusties of the year by the Upper Hudson Library System for their efforts in securing annual tax levy funding.